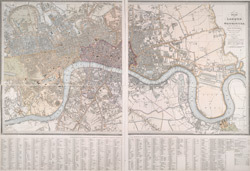 This folding map of London was originally published by Faden in 1818 as an index to Horwood's famous map of Regency London. This is a later edition of the map, issued by Wyld when he took over Faden's publishing business. The title, explanation and scale bar feature at top right. The boundaries of the City of London and Southwark are outlined in colour. The map is divided into squares with letters and numbers for reference along the margins for reference, with an interpretive key in panel below the plan.